The FM 120 BucketWheel ... popular solution. 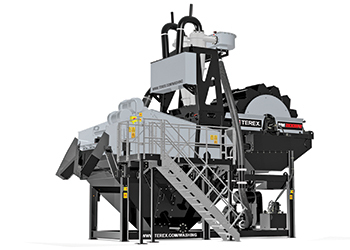 As Terex Washing Systems (TWS) this year marks the 15th anniversary for its revolutionising Finesmaster (FM) BucketWheel range, the company has recently applied modifications to the plant to further enhance its capabilities and effectiveness. The FM BucketWheel range was first introduced to the aggregates industry in 1990, and continues to be a popular solution with sand producers who want a reliable, efficient, durable sand plant offering longevity, reliability and ease of maintenance, all characteristic of the BucketWheel system. Sand producers have worked with this technology for decades and with the added technology of the cyclone system, this allows producers to reap the recovery benefits. Justin Donnelly, TWS Applications specialist and the company’s longest serving member, who has played an integral role in the development of the FM Bucketwheel, says: “When we looked at how we could produce two grades of material in a practical and economical way without adding a second pump and larger cyclones to the FM BucketWheel, we turned to the tried-and-tested method of BucketWheels. Sand reserves and the lack of them was effectively the driving force behind the demand for this efficient plant design. TWS global distributors and customers required a system that would allow them to capture more sand and eliminate losses to the tailing ponds as well as for customers who were trying to process more challenging materials with higher percentages of silt. Quarry owners also wanted to produce a drier product which could be loaded directly off the belt onto a lorry, reducing the handling process. A number of ideas were proposed from the research and development team at the time; the concept of combining the BucketWheel, cyclones and a dewatering screen on one chassis proved to be the most effective solution to meet the customers’ needs. 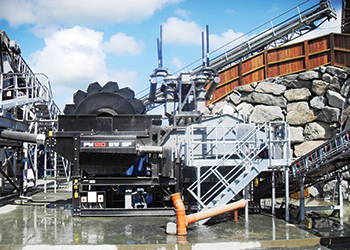 The first FM Bucketwheel produced was the FM 100BW for a site in Northern Ireland. After running and testing the plant for a number of weeks, it was apparent this new plant would revolutionise the sand washing industry. Over the last 15 years, the FM BucketWheel remains to be an effective solution for customers, with many recent installations around the globe including the US, Middle East, Russia, Scandinavia, Australia, Turkey and Ireland. Customers want to reduce loss of saleable product to their ponds and produce dry sand(s), which is a key benefit of the FM BucketWheel. The combination of BucketWheels and cyclones offers very low levels of maintenance as rubber liners last for long periods. The FM BucketWheel plant has the added benefit of processing two sands simultaneously. The split is made on the aggregate rinsing screen’s bottom deck with two slurries sent to the FM BucketWheel via two 250-mm mining spec hoses. The BucketWheels process the coarse sand product, while the cyclones process the fine sand. These two sands are dewatered on a split dewatering screen to produce two grades of sand which can be blended before stock piling via the two grade blending chute. The FM 200 BucketWheel ... powerful. In recent modifications to the plant, TWS has created an option, whereby four cyclones are fitted; this complete fines recovery unit has the ability to capture material down to 38 micron. This plant is proving very popular in manufactured sand applications where sand down to 38 micron can be used in concrete and mortar sands. The BucketWheels help to reduce the wear on the centrifugal pump, pipework and cyclones. The FM BucketWheel range employs Linatex G4-Cyclones which are said to offer excellent efficiency and fines recovery characteristics. The dewatering screen has been developed to produce more energy and greater dewatering capability. Serviceability and access have also improved with galvanised access stairs and platforms now standard. Garry Stewart, TWS Applications team lead, comments: “The FM BucketWheel continues to be one of the key sand plant solutions in many regions around the globe. This is mainly due to the BucketWheels performing up to 90 per cent of the work, which ultimately lessens the load and wear on the rubber-lined pump and cyclones. The FM BucketWheel can process a wide variety of applications in a range of capacities, including 60, 120 and 200 tonnes per hour (tph) models, as well as 120 and 200 Super Fines models.